Check out Sassy the highly opinionated miniature schnauzer’s blog Schnauzer Snips for her latest thoughts and adventures. I have been making miniature kimonos for friends and family for over 12+ years and for my Etsy shop for nearly 2 years. After talking to my sister who I like to bounce online sales ideas off, I decided to do one more batch of miniature kimonos for the tierneycreates Etsy shop and then be done with making miniature kimonos. I have so enjoyed making them and seeing them hung in the homes of friends and family. I had a nice response to them on my Etsy shop with repeat customers on the miniature kimonos, which was quite an honor. Now I am ready to move on and create other small handmade items I can offer on my Etsy shop at reasonable prices. I will still make a miniature kimono on special request. For my last official batch of miniature kimonos, I made 24 and gave one to my sister for her birthday and listed the rest on the Etsy shop. I used new color combinations and embellished some with cool antique buttons a friend shared from her mother’s/grandmother’s collection. 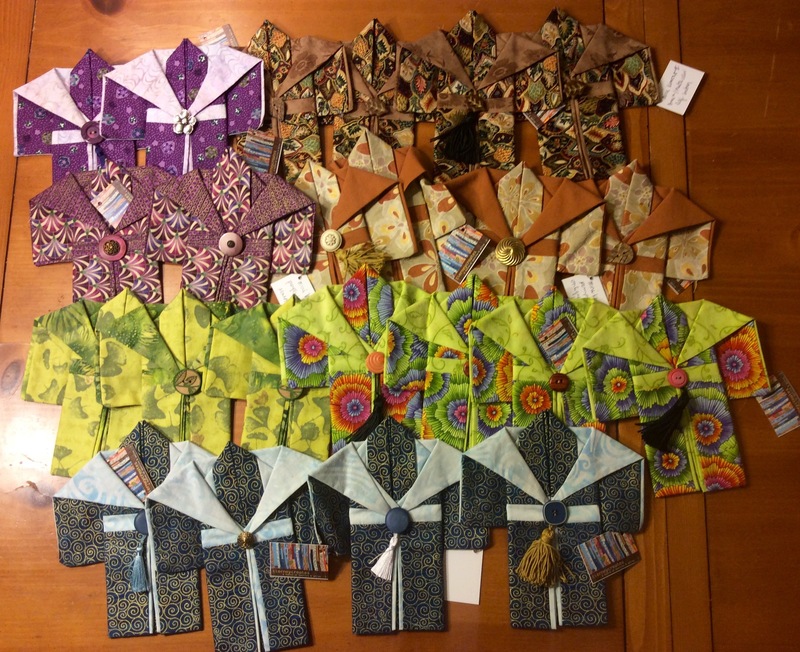 I am pretty pleased with this batch and I was tempted to keep some for my personal collection of miniature kimonos (I have them displayed in shadow boxes or hanging from chopsticks in my house). Miniature Kimonos we had a good run – I know you have brought smiles to many!